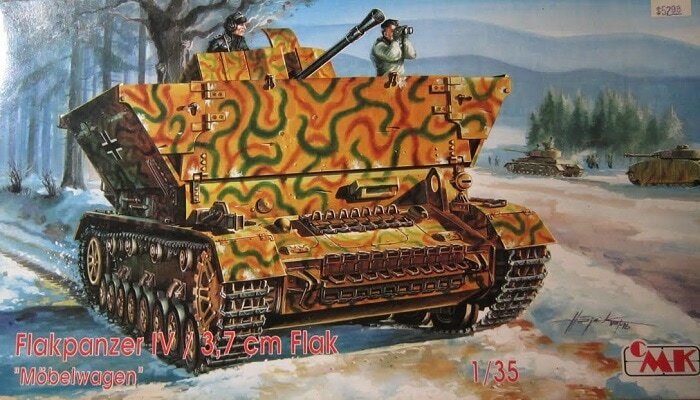 German Flakpanzer IV/3.7cm Flak "Mobelwagen"
MSRP: $52.98 years ago. Now out of production. Due to the increasing Allied air superiority from 1943, and also thelosses of German tank units, this was the reason for starting the development of various combat vehicle built on the Pz.Kpfw. 38(t) and the Pz.Kpfw. IV undercarraiges with anti-aircraft armament. Instead of the tank turret an anti-aircraft gun was installed and its crew was protected by double 10 mm thick armour plates. So fitted vehicles received a the nick-name "Mobelwagen" (furnature van). The prototype was finished at the end of 1943 and the Mobelwagen, which is the model in this kit, was approved for production . It was armed with a 37 cm anti-aircraft gun 43. A total of 240 vehicles was produced from the spring of 1944 to the end of the war in the Czech company CKD (during the war known as Bohmish-Mahrische Maschinenfabrik). The improved Maybgach HL 120 TRM 112 engine with 272 hp output and 2,800 rpm was installed. Its speed was 38 km/h. The regular crew of seven men was in combat area reduced to four. The "Mobelwagens" were in use on the Western Front only, because of front line units requests for some better protected anti-aircraft vehicles being developed. One of them is also called "Ostwind" produced by CMK as kit no. T35004. CMK is a model company base in Prague, Czech Republic. CMK stands for Czech Master's Kits. This kit came in a shrink-wrapped end opening type box that has a inner tray in it holding the parts. I like this arrangement, because a straight end opening type box allows parts or the decals to find their way past the end flaps to become lost forever. This tray prevents that from happening. The box art shows a Mobelwagen exiting a woods on a snow covered trail. In the background are 2 Pz.Kpfw. IV's and some troops. (dunkelgrun) and red brown (rotbraun) over it. There are large German crosses on the sides of the shields. 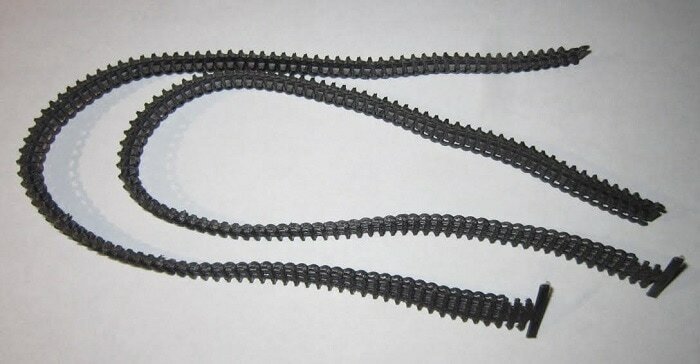 No other markings are shown. Two crewmen are looking out of the top. One is dressed in black panzer uniform and is wearing earphones. He is manning the machine gun. The other crewman is in a white winter parka and is looking through a pair of binoculars. This box art can easily have the words trimmed off the bottom of it and be used as a wall decoration in a hobby room. The bottom of the box serves as the painting schemes instructions. Shown is a side view of the fighing compartment showing the side shield lowered. The second side view shows a Mobelwagen with its shields up in a base of dark yellow with wide vertical bands of dark green and red brown. The German cross is forward on the sides of the hull. 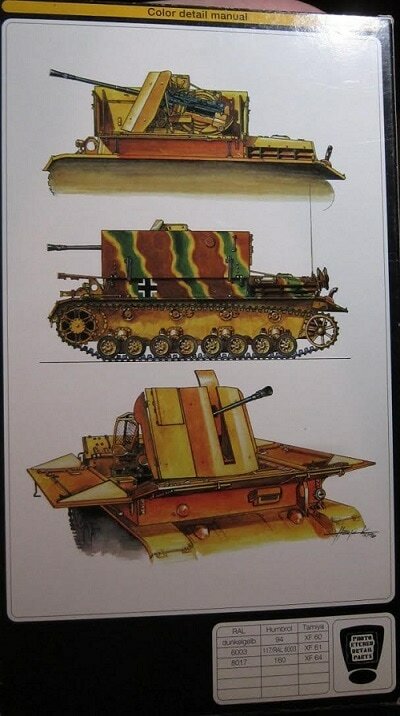 The third illustration shows the Mobelwagen head on, with its shields lowered in overall dark yellow. Below these color illustrations is a listing of the three colors mentioned above by RAL. Humbrol and Tamiya brands of paints. 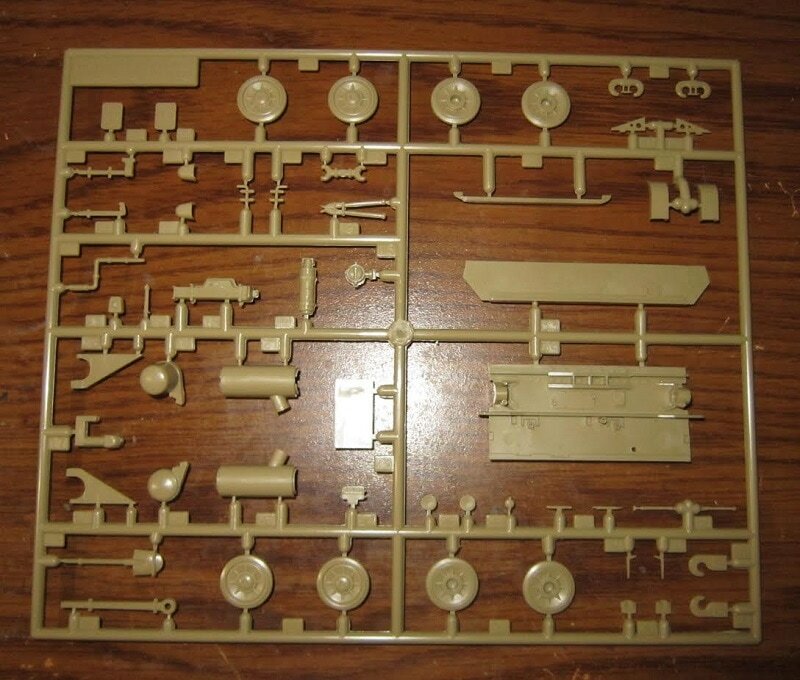 ​One side panel of the box says the kit was manufactured by CMK in the Czech Republic , with cooperation of Tamiya INC., Japan. This is followed by the kit's features in Czech, English and German. 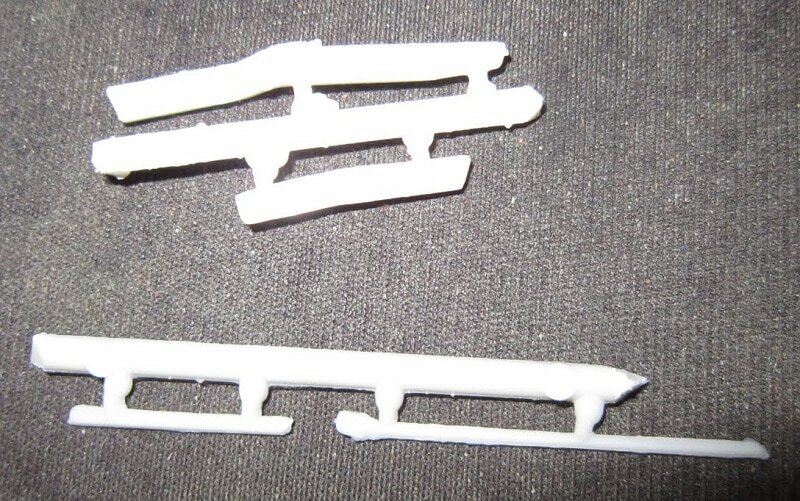 The kit contains a complete plastic model. 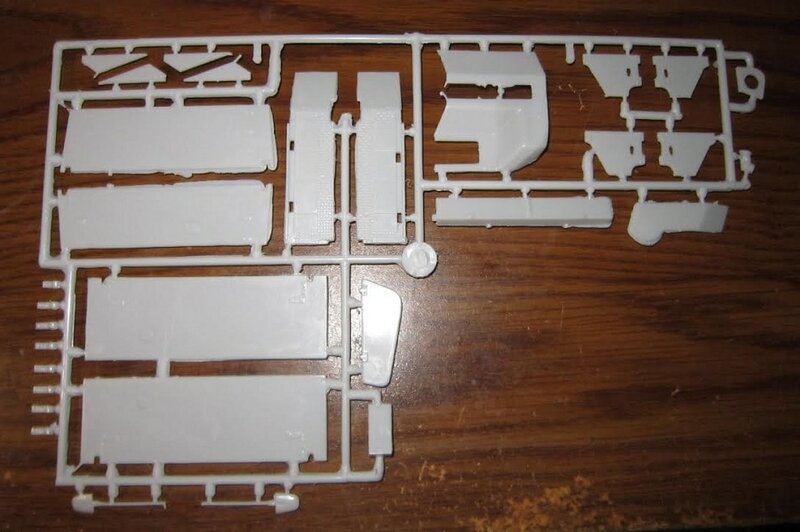 Photoetched parts, a decal sheet, three language instruction sheet, glue and paint are not included in the kit and must be purchased seperately. May contain small parts and sharp edges. Recommended for modelers 10 and over. Have a pleasant time with our kit. Kit was made with cooperation of CMK and MPM. MPM is also based in Prague, Czech Republic. 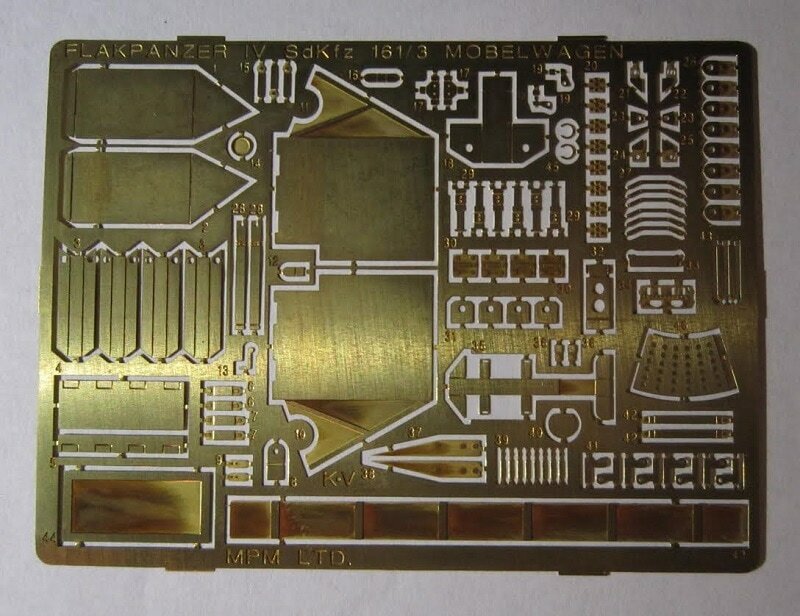 The other side panel repeats the mention of being made in the Czech Republic with Tamiya's help. Followed by a one paragraph history of the Mobelwagen in Czech, English and German. The kit is distributed by MPM and their street address in Prague is supplied. 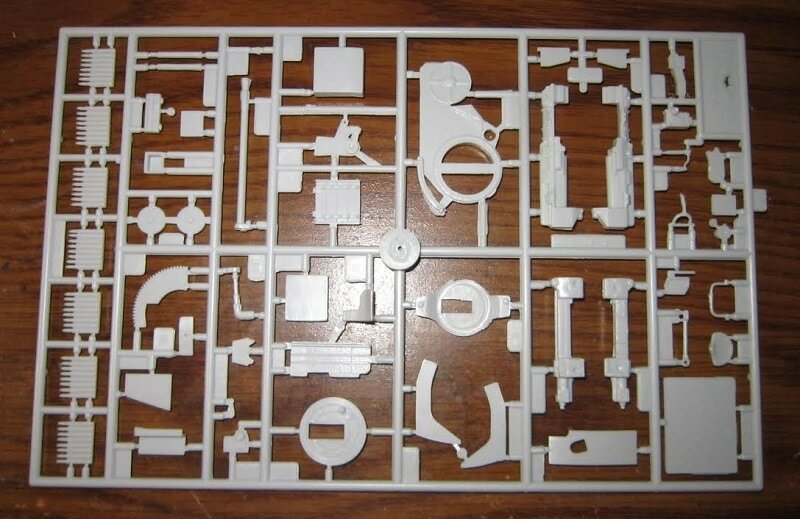 The kit contains 2 light tan trees, a light tan hull tub and hull roof, 4 light tan trees, black vynil tracks, black vynil poly caps, white metal parts, a brass PE fret and the instructions. There are no decals in the kit and they should have been included. Although only German crosses are shown in the paint schemes. Easly found in my decal file anyway. The instructions consist of a single sheet that accordion-folds out into 8 pages in 6" x 8 1/2" page format. Page 1 begins with a black and white repeat of the box art, followed by the history of the Mobelwagen in English, German and French. Page 2 has the parts trees illustrations over international assembly symbol explanations. Page 3 has a paint color listing over the first 2 assembly steps. Page 8 has 3 side views of schemes. The first scheme is a base of dark yellow with wide vertical wavy bands of dark green and red brown. The German cross is on the forward end of the hull sides. The second scheme is overall base of dark yellow with squiggles of red brown and dark green (the box art subject, already discribed above). The third scheme is overall dark yellow only with the German cross on the sides of the fighting compartment side shields. It says "Flakpanzer IV/3.7cm "Mobelwagen", 1 SS Panzer Division, "Liebstandarte Adolf Hitler", Ardennes 1944." However, is this for all 3 schemes? It does not say. 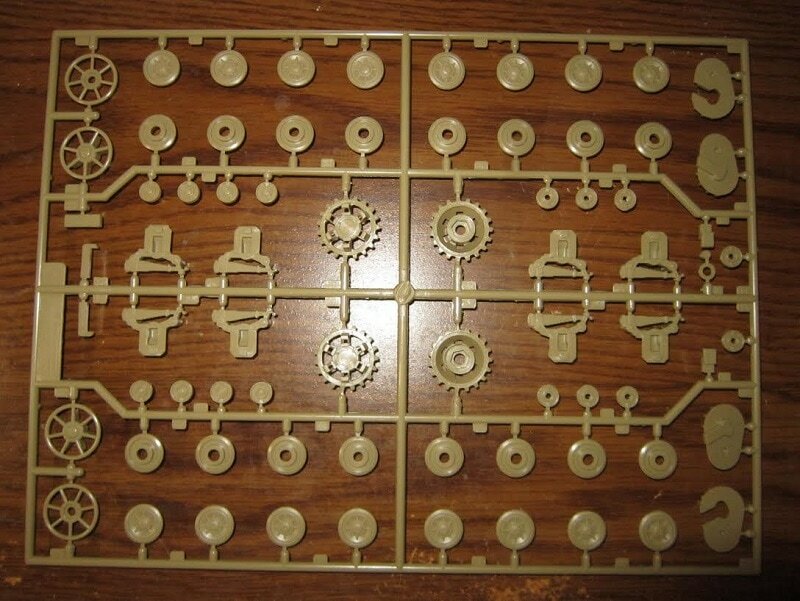 Large light tan letter A parts tree holds: the road wheels, idler wheels, drive sprockets, bogies etc. (74 parts) Six parts are shaded out in the parts trees illustrations as being excess and not needed to complete the kit. ​Medium sized light tan letter B tree holds: more road wheels, the rear hull wall, muffler halves, tools, tow hooks, jack, headlight, fire extinguisher etc. (56 parts) Fifteen parts are shaded out as being excess on the part trees illustrations. 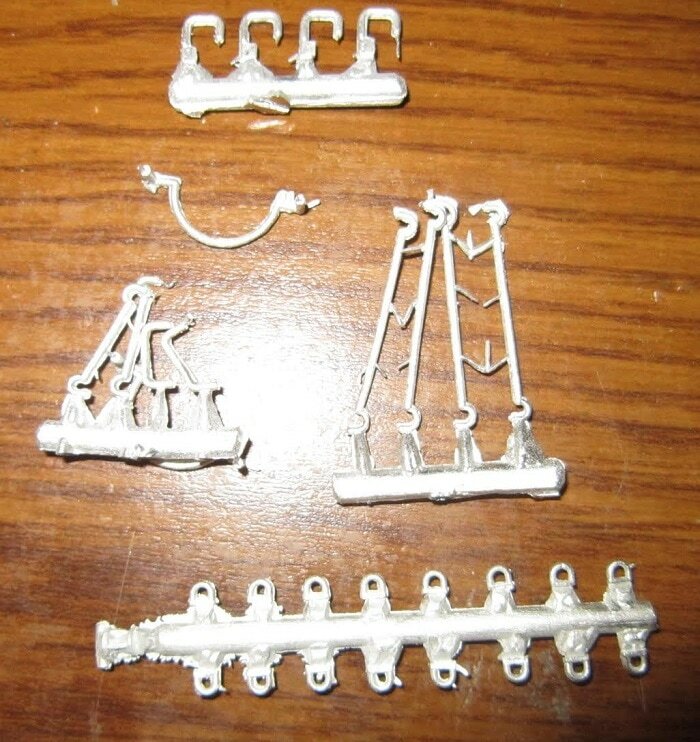 ​Medium sized light grey letter C tree holds the parts of the fighting compartment shields (31 parts). There are no part number tabs on this tree, however the parts are numbered in the parts trees illustrations. So referral will have to be constantly made to those to get the right parts for assembly. ​Letter D parts are small ones. They include 2 light grey antenna, a light tan vision block and 2 light grey gun support rails. ​Lettering jumps to the large light grey letter GA tree. It holds the gun parts and ammo rounds. The tree itself is labled as letter A, so be careful. (53 parts) One part is shaded out as being excess. ​Letter K is a length of steel wire. ​Lettering jumps again to the letter M brass PE fret. It holds some shield parts etc. I absolutely lost count of how many parts are on this fret, but there are a lot of them. Just look at the picture of it please. The kit supplied tracks are also vinyl. ​Final light tan parts are the hull tub and hull roof parts. The hull tub has Tamiya molded in it with the kit no. 35054 and the copyright date of 1975. It also has several motorization holes in it that will have to be puttied up. This is one neat multi-media kit. Only thing missing is some crew figures. Recommended to modelers that have done another kit with dissimular material parts. This kit is not for the novice, nor is it a weekend project. 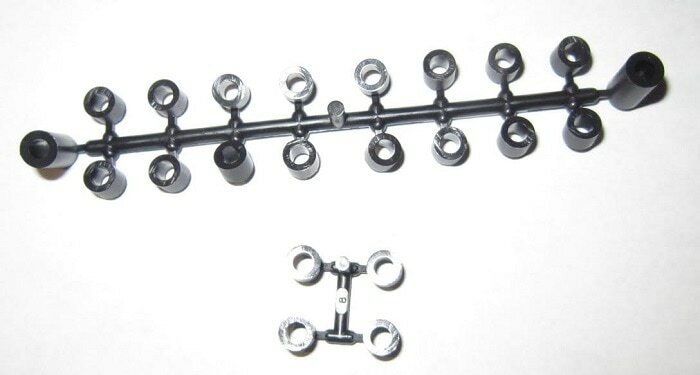 ​I purchased my kit years ago, but I don't know where.